Given that Brooklyn is currently the most-happening New York City borough, it’s easy to skip over the old haunts in favor of its new trendy districts. One old area is the busy commercial district that runs along 86th Street. 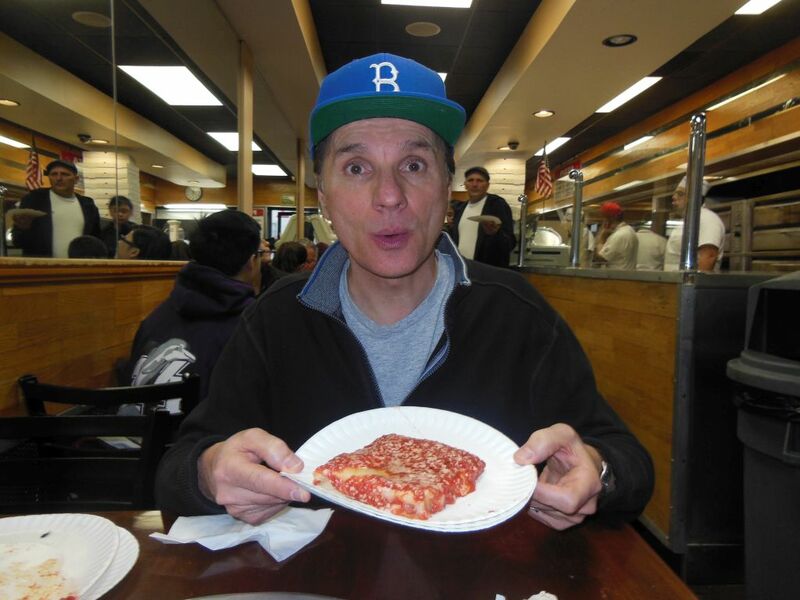 The Pizza Snob found his way there one Saturday morning to finally visit one of the Holy Grails of Brooklyn pizza, L&B Spumoni Gardens. 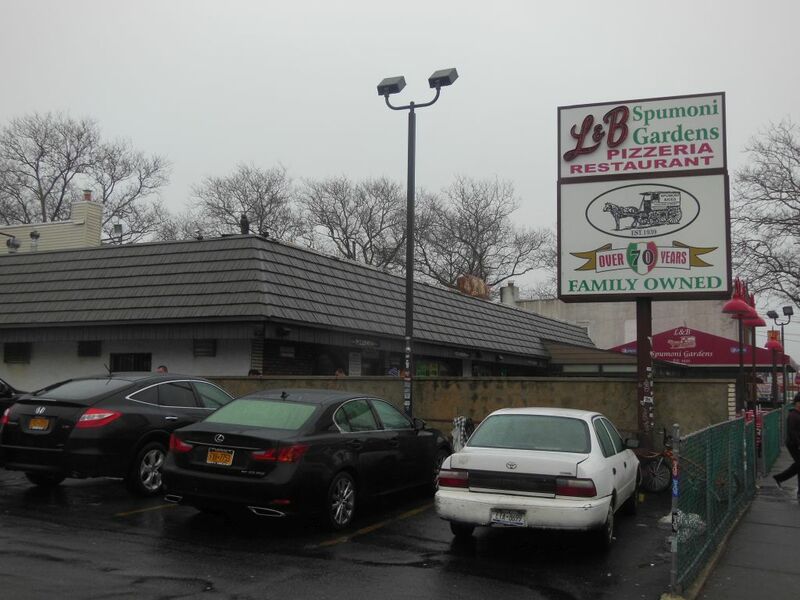 Since 1939, L&B has a long history in which an immigrant Italian family’s spumoni ice cream business developed over the years into a landmark restaurant and pizza joint. I first heard about L&B as the place where Joey from Nashville’s Joey’s House of Pizza learned to make pie. His daughter Stephanie was the first to tell me about their legendary “upside-down Sicilian. So Bro and I made the journey by car to Brooklyn finding L&B just a few blocks beyond where the elevated subway platform ends its reign over 86th. It was raining pretty heavily, but there was still quite a lunchtime crowd on hand. The adjacent free parking lot was full, but we waited just a few for someone to pull out. Ahead of us stood L&B’s three-building empire spread across most of the city block. Both the restaurant and luncheonette were closed at this hour, but the pizzeria was open and busy. 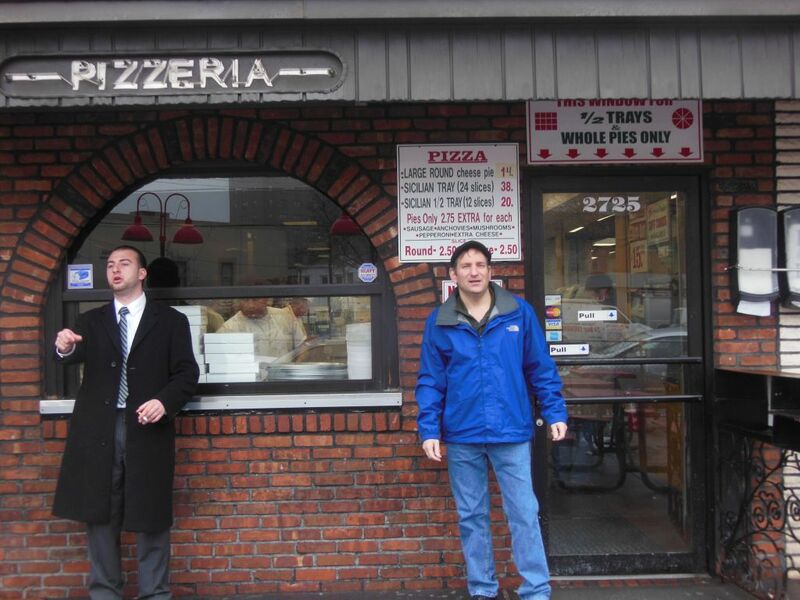 Even before you enter the pizza shop, a sign foreshadows the simple choices of your upcoming dining experience: Round or Sicilian (Square) by the slice or pie including a ½ option on the Sicilian tray with only five toppings available (sausage, anchovies, mushrooms, pepperoni and extra cheese). Entering the small narrow shop, I felt as if I was walking into a pizza factory! 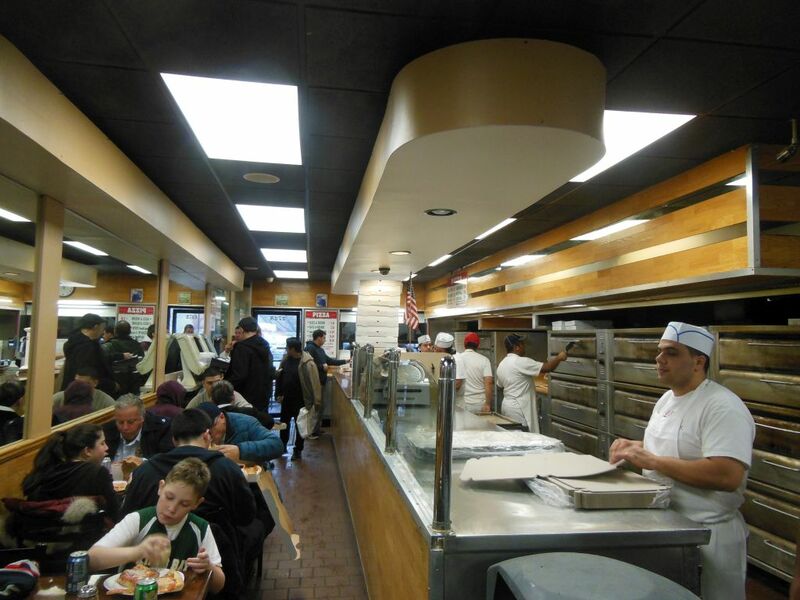 There must be at least a dozen conventional pizza ovens along the left wall with no less than a half-dozen guys taking orders and cooking pies. The rear wall was lined with the largest collection of empty pizza boxes that I have ever seen! Facing some intimidation at the counter to order quickly (so that’s where Nashville’s Joey learned how to be the “Pizza Nazi”) we unhesitatingly each ordered a slice of both kinds at $2.50 a pop. Needless to say, we didn’t have to wait long. 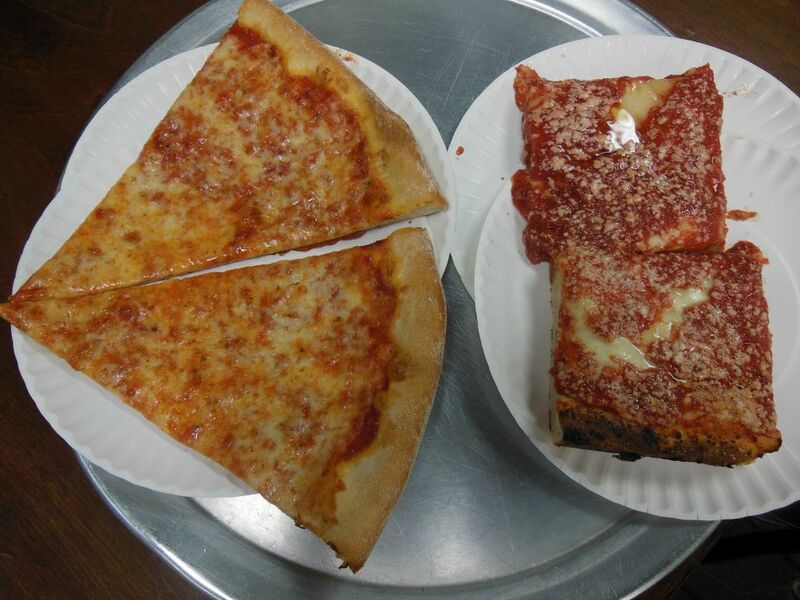 Our round and square plates were promptly filled with hot slices right from the oven. We eagerly retreated to the far back end of the row of tables opposite the wall of ovens. I couldn’t resist starting with the exotic-looking Sicilian—unofficially coined as “upside-down” since the sauce is on top of the Mozzarella cheese. It is a work of art that is no less delicious than it is beautiful. I lucked out with a nice end piece that was crispy on the edges and fluffy on the inside. The tasty sauce on top was lusciously laced with a touch of zesty Parmesan to bring it to life. Yummy and delicious—I was now wishing that I had ordered a pair! The plain cheese on the other hand was just that—a bit plain, but nonetheless, made with excellence. Near perfection, but just a little bit rudimentary for a place as famous as this. Specifically, it was dryer and not as crisp as I prefer. Plus, the flour used in the crust had a different taste that I couldn’t put my finger on. That out-of-this world Sicilian was just a tough act to follow! L&B is an absolute must visit for any pizza lover. It’s entry in to the Snob’s Hall of Fame is a given, but it is on the merits of the Sicilian. I am giving L&B my first ever split-rating. Again, don’t miss this place if you have a chance. I will be back, and maybe next time I will also try the ice cream next door! So sorry to hear that. I’ve only been once and had a good experience. I’m also surprised since this place seems to be so famous. Thanks for all the tips though. They all have been noted. I just had it today and I had the same sentiment about the Sicilian. I tasted bread and sauce with some strong, but scant, parmesan. Not worth the trip. N&D corner of W 9th Ave U, go around the corner walk straight up to Ave U, across from Telco. Enjoy! Thanks for the tip–I will get there someday!